Cheddar Cheese comes from England in a town called Cheddar. 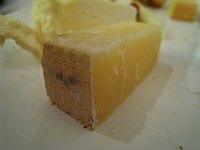 Cheddar Cheese is referred to as cheddar now, because of the unique cheddaring process of cheddar cheese. A rich nutty flavor with a semi-hard firm texture is the famous cheddar cheese. Cheddar Cheese is white in color, it is yellow from artificial coloring. The longer Cheddar is aged the sharper it is. This cheddar cheese recipe is slightly different, because it uses a stirring process rather than cutting the cheese into strips and draining them. Here's how to make your own homemade Sharp Cheddar Cheese while saving a couple of hours! Warm the milk to 90 F using a double boiler. Add 1oz. of mesophilic starter culture. Mix thoroughly with a whisk, the culture must be distributed evenly throughout the milk. Let the milk ripen for 1 hour. Put the 1/4 tab of rennet into 3 to 4 tablespoons of cool water and let dissolve. Slowly pour the rennet into the milk. Stir constantly using the whisk. Stir for at least 5 minutes. Let the milk set for 1 to 2 hours. Once a firm curd is set and a clean break can be cut, take a long knife and cut the curds into 1/4 inch cubes. Allow the curds to set for 15 minutes. Slowly raise the milk to 102 F. It will take 45 minutes to raise the milk to this temperature. While you wait, gently stir the curds occasionally so they do not mat together. Cook the curds at 102 F for another 45 minutes. Keep stirring the curds every few minutes so they do not mat. Drain the whey by pouring through a cheesecloth lined colander. Do this quickly without letting the curds to mat. Put the curds back into the boiler at 102 F. Separate any curds that have matted together. Add the tablespoon of salt and stir together. Cook the curds for 1 hour stirring occasionally. Gently put the curds into your cheesecloth lined mold. Press the cheese at about 20 lbs. for 45 minutes. Remove the cheese and flip it. Press the cheese again at about 40 lbs. for 3 hours. Remove the cheese and flip it. Press the cheese for the third time at about 50 lbs. for 24 hours. Remove the cheese from the press. Place the cheese on a cheese board and let dry at room temperature for 3 to 5 days. Wax the cheese and age it in your refrigerator for 3 to 24 months. Remember the longer the cheese is aged the sharper it will taste! Every few days flip the cheese. Before making Sharp Cheddar Cheese make sure you have enough time so there will be no interruptions. Make sure there are no drafts. Be careful not to use hot water, for it will kill the rennet's enzymes! What Makes a Cheese Mild, Medium or Strong?